Negorci spa is located near Gevgelija, close to the village Negorci, at 6 km, from the Greek border. Negorci spa is located in extremely pleasant surroundings, at the bottom of the mountain Kožuf, at the height of 22 m, amidst European ash woods, which form a natural park. Within the Negorci spa-resort there are two waters: "Vrela banja"/hot, and "Ladna banja"/cold, or so called "Sukripasina". The waters in the "Vrela banja" have temperature of 400C, and of "Ladna banja" 380C. The Negorci spa-water here is believed to heal people of various ailments: all kinds of rheumatic diseases of muscles, ankles and wrists, disturbed menstrual cycles, sterility, gasthro-intestinal diseases, diseases of the cardio-vascular system, inflammations and other diseases of the peripheral nervous system, as well as other kinds of dermatological diseases. The spa-resort here is furnished with modern devices for electro-therapy, Chinese-therapy, paraffin therapy and underwater massage, led by specialist physicians and a full complement of medical staff. 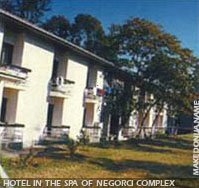 Included within the complex of Negorci spa are 3 hotels - the 2nd class: hotel "Jasen", possessing 150 beds, the hotel "Ilinden", with 100 beds, and hotel "Buzor" with 80 beds. The spa-resort also has tennis courts. The pleasant climate and the mild winters create ideal conditions for recreational-sports training. The Negorci spa-resort is connected to Gevgelija, which is only 3 km away, by bus lines which operate every hour in both directions. At the height of 730 m near the village Konsko, 27 km from the Negorci spa, is the healing center Smrdliva voda. Drinking the sulfurous-mineral water helps during the treatment of inflamed kidneys, gastritis, and the early stages of stomach ulcers.